Cloud storage services like Google Docs, Dropbox, Amazon S3, etc. have made it easy for you keep your important files and documents online. These services are mostly free and you can have multiple accounts on them as long as you use separate email addresses. This leads to another problem though. When you have files spread across multiple cloud services, managing them can be challenge. 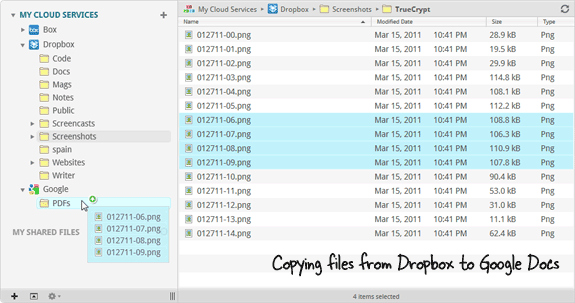 You may have stored one group of files on Dropbox, the other on Google Docs while some of the older files could be hosted on your old Google Docs account that you abandoned long ago. Would it be nice if there were an easy to way to manage / search all your online files from one place without having to download them to the computer first? Meet Otixo – an impressive web-app that lets you access files stored across different cloud service from a central location. To get started, you associate your Dropbox, Google Docs, Picasa, Amazon S3 and other online accounts with Otixo and then you can easily move or copy files between any of your accounts via simple drag-n-drop. Otixo supports FTP so it can also be used to directly transfer files from any FTP server to Google Docs or Amazon S3 without having to write complicated scripts. You can even add multiple accounts from the same cloud service – like your old and new Google Docs accounts – and transfer file across these accounts easily.